One major question for the human mind is how life continues. One of the most important mechanisms for all life cells to give offsprings is undoubtedly the DNA Replication. DNA Replication answers to the question: "When a cell divides, where the extra DNA comes from?". What "DNA Replication" is? It is the process that can duplicate the DNA of a cell. The next step is the cell to duplicate! Every cell (of eukaryotes or prokaryotes) has one or more DNA (or RNA) polymer molecules that need to duplicate in order the cell duplication to take place. This is what DNA Replication -aka DNA Synthesis- succeeds. In the eukaryotes (organisms with cell that have nucleus) the DNA is formed in two strands, each composed of units called Nucleotides. The two strands look like two chains that form the DNA Double Helix. 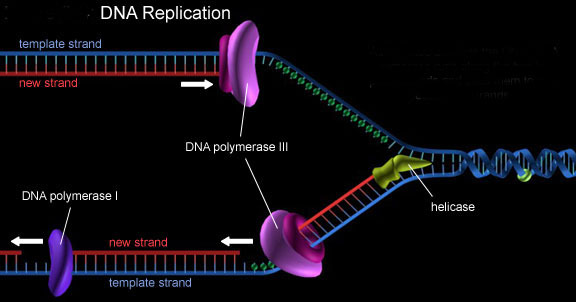 The DNA Replication Process is capable of opening the Double Helix and separating the two strands. Then the two strands are copied. As a result two new DNA molecules are created. The next step is the cell division. After that a daughter cell is created. In its nucleus lies a copy of the parental DNA. Follow the links in the left menu in order to find more info about the DNA Replication Process.